I woke up earlier than usual this morning to the familiar ping-ing of my phone. In my semi-asleep state, I wondered what was so important to warrant such an early wakeup call. It was Twitter, alerting me that Time had named its “Person of the Year.” I was instantly wide awake after reading who exactly was given the honor: The Silence Breakers. Women and men who have stood up and called out the rampant sexual abuse in their respective industries have been named “Person of the Year.” These brave individuals birthed and strengthened the #MeToo movement while uncovering sexual predators in Hollywood and Washington D.C., and in the worlds of business, journalism, academics, agriculture, medicine, hospitality, and more. The decision to name The Silence Breakers as “Person of the Year” may not come as a surprise to some considering the current (and much needed) swell of victims coming forward with their stories, but it’s much more significant than you might realize. This acknowledgement from one of America’s most respected publications brings validation to so many people who have faced abuse, doubt, blame, shame, and ridicule when they’ve come forward with their own reports. But more than that, it gives recognition to victims who suffer silently; unable to come forward with their stories of harassment for deeply personal reasons. Looking at Time’s cover, many faces associated with the fight against sexual assault stare back at readers — stoically united in both their pain and the power of their cause. We see actress Ashley Judd, singer-songwriter Taylor Swift, migrant worker Isabel Pascual (name changed), corporate lobbyist Adama Iwu, and former Uber engineer Susan Fowler — and then we see an extremely significant. very purposefully cropped elbow placed at the bottom right corner of the cover. The elbow belongs to a hospital worker who has experienced workplace harassment, but remains anonymous and unable to come forward with her story. Her inclusion on the cover represents the countless number of women who experience abuse, but are forced to remain silent. She isn’t the only anonymous member included in The Silence Breakers cover story. Other featured survivors utilize fake names (like migrant worker Isabel Pascual) or remain nameless. Regardless, their stories are no less important to the narrative. As someone who has only recently told my own story of sexual harassment, I was once — not long ago — that anonymous woman. Before I found my voice, I was anonymous. When society told me I was overreacting, I was anonymous. When I was afraid to tell my story because of judgement and backlash, I was anonymous. In fact, every woman and man who has shared their story was once that same anonymous person. We all know the forced silence. We all remember being compelled to hide our hurt and leave injustices unreported. But it’s important to remember that even when we were anonymous, we were valid. The individuals who remain anonymous are as important to the #MeToo movement as the ones who can share their stories. 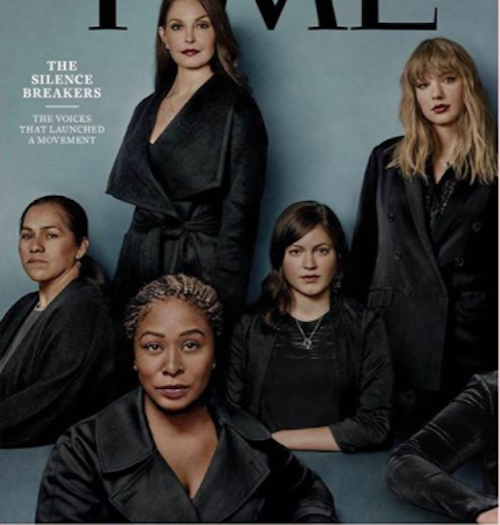 Including them as part of The Silence Breakers was Time’s acknowledgement of their strength. In short, this is a big deal for all of us. As I read more coverage of this monumental cover, I can’t help but see it as another step towards a society that believes women, a society where we won’t be forced into anonymity any more.